Too dangerous to move, these explosives were gathered for "blow in place"
The bomb world swims in alphabet soup. 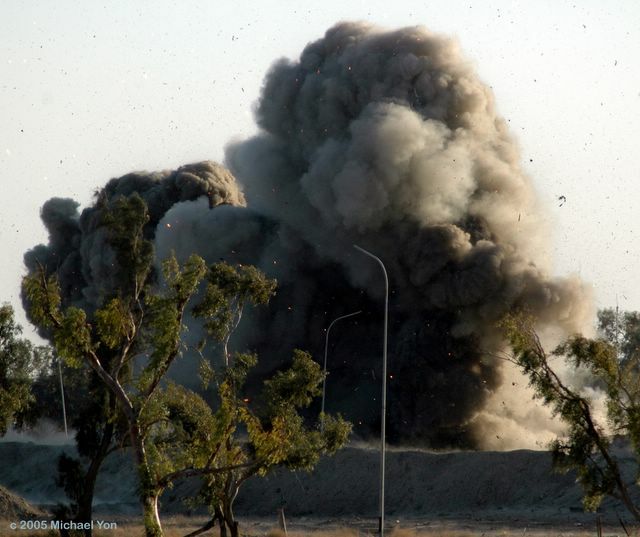 Consider the ubiquitous IED--improvised explosive device. These homemade bombs are the most lethal weapons being employed by the enemy. 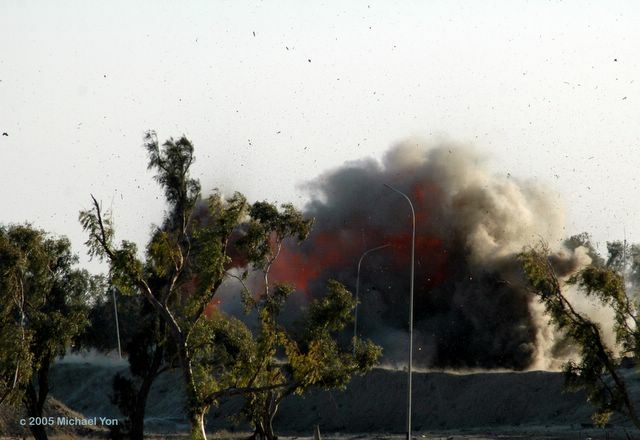 More troops are killed by IEDs than by any other weapon in Iraq. Given the lethality of these bombs, a reasonable person might assume that it takes a measure of stealth and cunning to acquire the base components. 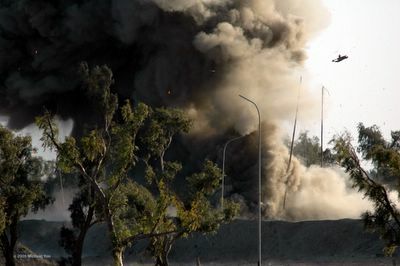 But in Iraq, it can require only stooping to pick explosives off the ground, since much of the explosive material used for making IEDs is just lying around. In fact, tons of unexploded munitions lay on the surface within walking distance from my quarters on FOB Gabe. 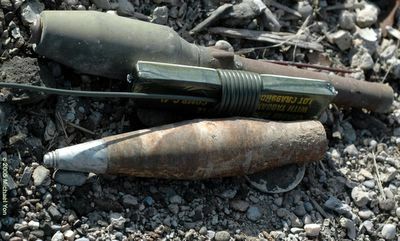 The munitions lying on the ground, on a back corner at Gabe, are from an Iraqi ASP (ammunition supply point) that was destroyed by American forces during the initial invasion. 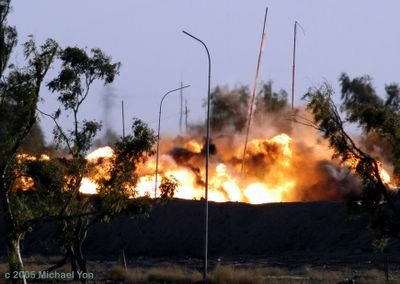 Judging from combat videos of bombs hitting bunkers and causing gigantic explosions, viewers might assume that all the ammunition inside was destroyed in that one devastating blow. Most bombs, when hit by other bombs, simply fly away and land on the ground with a thud. Bombs are patient. They sit and wait. Through scorching summers, freezing winters, buffeted by winds dense with dust and snow, they wait. Snakes may crawl under their metal skins, birds may light and perch on their noses, but they wait. Bombs may wait until a kid comes around and pings them with rocks, to see if one will explode. Or a bomb might have to wait for a "scrapper"--a metal scavenger--to come and hammer off its fuse. Scrappers who pick through war left-overs learn that bomb fuses are dangerous. The bombs that don’t kill kids or scrappers wait. They wait while time helps the weather bury them. Years later, a farmer pulls open the ground with a plough and his family at home feels the impact as windows shatter. Other bombs wait longer. A century after combat, long after the battles have passed from common memory, construction workers will hit bombs with shovels and machines. Modern bombs have long lives. 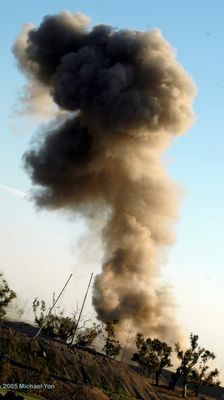 This is nothing new to Iraq or to war; after all, munitions from the American Civil War still kill people. Bombs do only two things well: wait, and explode. So, of course, insurgents collect bombs. This, too, is common to many wars. Until Coalition forces secured the "destroyed" ASPs and began the controlled demolitions (one of which is depicted in the photos accompanying this post), many tons of munitions had been picked through and hauled away. These are being returned by insurgents in the form of IEDs. To minimize this threat, and begin to get ahead of the supply curve, the Coalition is focusing on destroying derelict bombs in the fastest and cheapest way possible: blowing them up. An exploded bomb has spent its load of energy. The work is dangerous and requires expertise, most of which is being provided by former military Explosives Ordinance Disposal (EOD) specialists working as contractors for the Coalition. Each week they destroy literally hundreds of tons of explosives in Iraq. Some of the shots are small, like those here on FOB Gabe. Other shots are gigantic; perhaps 150 tons per shot. This work is happening all around Iraq. I feel shockwaves from controlled explosions every day. On occasion, I visit with the civilian EOD contractors here on Gabe, who destroy bombs before the insurgents recycle them. These experts know that bombs do only two things well, and when I talk with EOD people, and see them work, they often remind me of a kind of big cat: intelligent, purposeful, patient, . . . always thinking before doing . . . and then, at a time of their choosing, they release all that raw energy. Although this energy is unleashed in a percussive blur, the following series of photos illustrates the sequence in each distinct phase. Yesterday, I had lunch with a handful of American Army officers. We were talking about a "failed" buy-back program where the Americans paid five or ten bucks for each bomb that Iraqi civilians turned in. This conversation happened in a familiar place. As we talked, I remembered that the last time I was in this building, the walls shuddered, windows shattered; a large car bomb exploded in the street. And today, we had started out to have lunch in a different place nearby, but that place was freshly mortared, so we opted for lunch in the-place-with-new-windows and ate MREs, while medics attended a wounded American and two wounded Iraqis whose timing was less fortunate than ours. But perhaps it was the timing that made me push for more information about the defunct bomb buy-back program. Technically, it was an UXO buy-back program. UXO, as it's known in the parlance of EODs, refers to explosives such as bombs, mines, RPGs and mortars; the more common examples of unexploded ordinance. According to the officers, the program failed largely because some Iraqis possess an entrepreneurial spirit. Apparently, civilians with business leanings quickly learned that they could pay other civilians a dollar to dig up old anti-tank mines that were then turned in for five or ten bucks each. I had difficulty understanding that the insertion of the middle man somehow rendered the program a failure. If anything, to my thinking, the profit motive would enhance the incentive and speed up the munitions collection process. The officers explained that once the powers that be contemplated the potential size of cache, they calculated it would rapidly deplete the pile of cash, and so it was abruptly ended. But, I thought, what if there are a million pieces of UXO scattered over Iraq, outside of the ASPs that have already been secured. Further, say that enterprising Iraqis employ a small army of laborers to find and collect it all. At the close of business, we'd have paid out ten million dollars. Big deal. Ten million bucks. What if there are ten million pieces of UXO out there? That's still only a hundred million dollars. Up-armored Humvees are expensive, and dead soldiers never come home, and for every killed soldier, there are about ten wounded. Five or ten bucks per bomb is extremely cheap, even if there are millions out there. What isn't being turned in for cash is all too often being scavenged and turned into roadside bombs.